Alexis de Tocqueville has 1 media appearance. 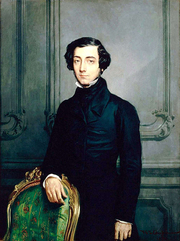 Alexis de Tocqueville discusses Democracy in America. Alexis de Tocqueville was a political thinker and writer still famous today especially for his Democracy in America, the classic work that appeared in two volumes in 1835 and 1840 following his travels in the USA. Also in 1835, de Tocqueville married Mary Motley, an Englishwoman, against the wishes of his family because she was not an aristocrat. Alexis de Tocqueville is currently considered a "single author." If one or more works are by a distinct, homonymous authors, go ahead and split the author. Alexis de Tocqueville is composed of 53 names. You can examine and separate out names.